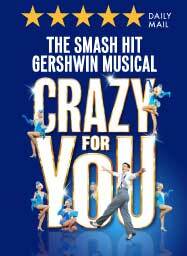 George and Ira Gershwin's comedy musical Crazy For You was the final production of last year's season at the Regent's Park Open Air Theatre. It subsequently transferred into the Novello Theatre in London's West End with an initial booking period to 28th July 2012. The show will now close four months earlier than planned and is due to end its run on 17th March 2012. The next production currently announced for the Novello Theatre is Mamma Mia! which closes on 1st September at the Prince of Wales Theatre which has been its home for seven years and re-opens at the Novello on 6th September 2012. Hi Grace, Couldn't agree more. Saw Crazy For You in the Park and at the Novello and absolutely loved it. Certainly aim to see it again before it closes in March. Have booked my fourth visit-I never normally see things more than once but it was such a happy show.And I thought Sean Palmer was a great all-rounder.I can't imagine Top Hat or Singing in the Rain will be half so entertaining.Any news of a tour? I haven't heard anything for 2012 and getting late now to fit it into touring schedule for this year. Maybe 2013? Will keep you posted if I hear anything.